The trains connecting Glasgow (South Western Scotland) to Plymouth (South West England) are run by Cross Country, Virgin Trains, ScotRail. The services on board will change depending on the train provider. 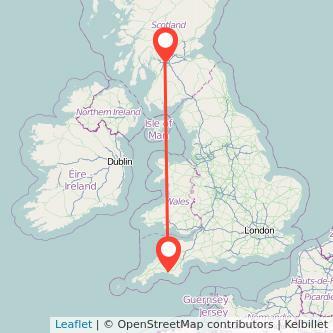 On average, it takes normally 9h59m by train to cover the 380 miles to go to Plymouth from Glasgow. The train duration can change depending if the train is direct or with changes. We found tickets from £123.85 to travel in the next month. Prices will vary depending on the day and hour of travel and how far in advance you purchase your ticket. Find the cheapest tickets to travel from Glasgow to Plymouth by train, bus, ride sharing and plane. When are the next trains to Plymouth? Based on our data, 3 trains from Glasgow to Plymouth are available today and 0 tomorrow. The first Glasgow Plymouth train leaves at 08:00 and the last one leaves the station at 23:03. The first and last departure times can vary every day and there can be fewer services during weekends as well as public holidays. Rail operators may also adjust the number of trains during school holidays or depending on the season. Getting your train ticket beforehand is often cheaper than leaving it to the day you travel. However, as you may see in the chart above, the price of train tickets Glasgow to Plymouth tend to remain approximately the same and cost £112. We compare train ticket for all major companies to travel between Glasgow and Plymouth by train and find the best prices for the coming days. Take a look at the prices of train tickets Plymouth to Glasgow and find the best deal for your outbound journey. Looking to travel for less? Many railcards and discounts are available to spend less for your Glasgow Plymouth train ticket and save even more money on your tickets: special train fares for children, railcards for all ages, group travel, or charity discount. There are different types of railcards available: 16-25 railcard, Two together railcard, Family and Friends Railcard, Senior railcard, Disabled persons railcard. In our example, A/B = £30/34% = £88.00. Then, 88/£199.30 = 0.44. Your railcard will be profitable if you're doing around 1 trips from Glasgow to Plymouth (one way trip).